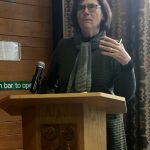 More than two dozen distinguished biographers from the United States and Europe met to talk about their work on November 4-5 at a conference co-sponsored by BIO and the Oxford Centre for Life-Writing. 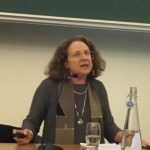 The weekend-long conference, called Biography Beyond Borders, a colloquium on American and European biography, took place in Oxford and London and included a pre-conference lecture by Carla Kaplan and a keynote address by Hermione Lee. Her Penelope Fitzgerald: A Life won BIO’s Plutarch Award for best biography of 2014. Last month, TBC featured photos from the weekend sent by consulting editor, past president, and BIO co-founder James McGrath Morris. He called the colloquium “a remarkable moment in our organization’s history. Biographers from around Europe broke intellectual and literary bread with their American colleagues in the storied setting of Oxford.” Morris added, “Almost all the credit for putting together this remarkable gathering goes to BIO’s vice president, Deirdre David.” Plans are now underway for another such meeting in 2018. 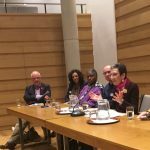 To read recaps of the panel discussions and some comments from some of the BIO members who toured two historic homes before the colloquium, go here.